I have no affiliation to the makers of these socks, but I am willing to stand up and say they are probably the best socks in the world. In the past I have tried all sorts: thick socks, two pairs of socks, cushioned sock, but at some point I have always got bad blisters and very sore feet. In the summer they would be very sore and hot, in the winter very sore and cold. 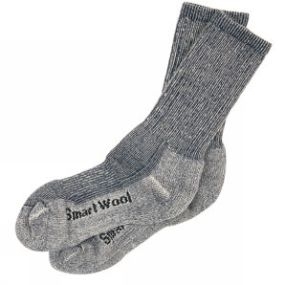 SmartWool socks may look like an ordinary pair of socks from the outside, but it is the inside that counts. Made from the softest Merino sheep wool, the inside is deeply piled – like the most luxuriant deep pile carpet. The fibres wick away moisture, create thousands of little air pockets that regulate the temperature of your feet, and – best of all – resist bacteria! So far I have yet to get any serious blisters from any of the hundreds of miles I have walked while wearing them. They are so soft and comfortable to wear that I have found a fresh pair are the best way to relax and relieve all foot tension after a long day of walking. This entry was posted in Tech and tagged Kit, Tech by Christopher. Bookmark the permalink. I was looking at a pair of these for walking the Camino de Santiago de Compostela in two weeks time. The route we’re taking is just under 800km so it’s going to be some walk! I think I’ll go and pick up two pairs when I’m back in Britain next week. They are pricey though! They are pricey, but so worth it. I have a couple of pairs, which I reckon have done more than 500 miles, and the only sign of wear is a little pilling on the outside. I worry my feet are wearing out quicker than the socks! Happy walking, hope to hear you and Linda talk about it on indietravelpodcast.com – which I love, please keep up the good work. Have you ever tried British Alpaca Socks? As a farmer I could never find socks that were warm enough in the winter. When you are lambing in January all night and exhausted you can get very cold indeed, as you might imagine. I bought some alpaca socks from an alpaca breeder and couldn’t believe how amazing they were – so good I started a company to make and sell them! The feedback has been terrific, people who have always suffered from cold feet now don’t. They also repel bacteria (I am sure Merino does the same) so you can wear them for weeks without a problem. Climbers and walkers also love them as you never get blisters and they wick away any moisture naturally. Give them a try! I haven’t tried alpaca socks, but I have heard lots of good reports. I will probably give them a go when my current walking socks get worn out. Thanks for the tip and the link. these socks are possibly the best pair of socks in the world! actually no wait, they are the best socks! i cant wait for my mother to buy me some more! slippin my tootsies into these fine cotton beauties is practically the the most orgasmic sensation i have ever had the pleasure and honour of experiencing. dope socks for a cheeky all nighter on the tracks with watson!